Amongst the historical highlights Bequia can boast a visit by the notorious British pirate ‘Blackbeard’! The island was a well-established watering hole and a source of lumber for buccaneers, privateers and pirates, so naturally Bequia has its share of swashbuckling tales! "Looking back, I hadn't a clue what I was getting myself into when aged 56, a lawyer in a previous life and property investor taking on a retirement project of this scale..."
My first taste of Bequia came in the same manner as many before & after me; arriving by sailboat. My brother Sten owned a beautiful ketch yacht which he frequently sailed in the Caribbean during the winter months. 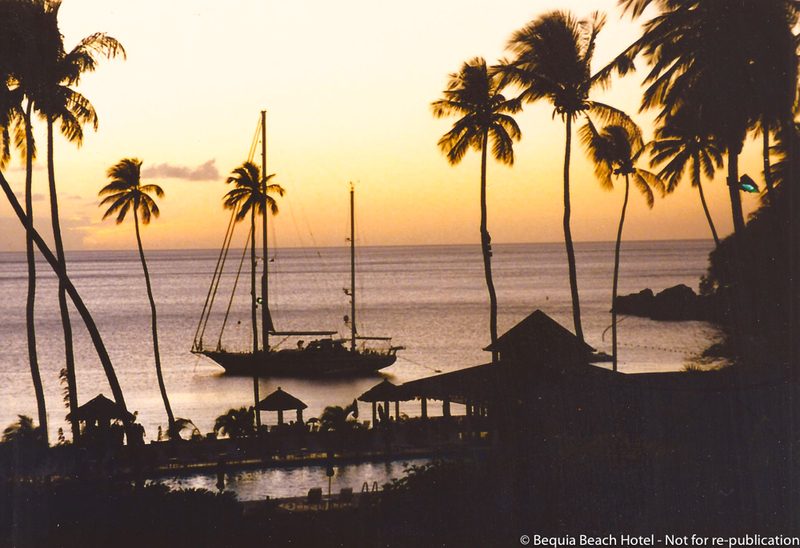 We would arrive in Bequia on ‘Sea Shuttle’ New Year’s Eve 1992, or as they say in Bequia "Old Year’s Night" we anchored in Admiralty Bay, Bequia – one of countless yachts back then. We left 8-year old Jennica & 6-year old Philip happy onboard with the crew and the best pizza delivered from Macs, the atmosphere in the bars along Belmont was electric and unforgettable, we danced through the night in the sand to sounds, sights and smells of this enchanting island. At midnight, a steel band played "Auld Lang Syne" - 22 verses at a higher and higher tempo. Whilst watching the constant ongoing fireworks as various yachts sent up their out of date flares celebrating New Year in their respective home countries. New year’s day we visited the old Swedish-owned Friendship bay hotel, spending the day on the beach at Friendship blisffully unaware of what would come in the future. It wasn’t too long before I once more set foot on Bequia, February 1996, sailing once more with my brother we visited Bequia – the island that had captivated me on our previous visit. The photo below taken of the old Friendship Bay hotel from Sea Shuttle as she lay anchored in Friendship bay by St. Hilaire. Several years would pass until Bequia called once more, a few years after the millennium I had started looking for a villa in a warmer climate. I had extensively travelled the Caribbean and also the Indian Ocean. In 2004 I was again invited on a sailing trip in the Grenadines this time in March. During this visit to Bequia in the slow season I found the island character different from the party mood at New Years but it had hardly changed since my previous visits, charming, sleepy it was still like a postcard from the old Caribbean, reminding me of my first visit to Saint Barthélemy in the late early 1980s. On a walk at one of the deserted beaches, Friendship Bay, I found an old, closed Bed & Breakfast (Bequia Beach Club) with a "for sale" sign and a telephone number. It had previously been owned by a German couple. The location was perfect; in the middle of the long crescent-shaped beach with just a few local houses and fishermen as neighbours. Coming back to London I began to wonder - How do I actually get to Bequia? I can't have a holiday home far away in the middle of the Caribbean which you only can access via a sailing boat. Within a week I was back! After realising an airport had been built since my first visit connecting Bequia with Barbados via a simple 45 minute island-hop. I had found the ideal spot, acquired the derelict B&B and as many adjoining properties including another german-owned B&B 'Blue Tropic and as much land as possible as I had a crazy idea in my head; instead of building a holiday villa to build a resort. I found Bequia had the most wonderful climate, due to the trade winds, never colder than 25 and hardly warmer than 32 and not humid as in many places in Asia. The temperature in the clean turquoise sea ranged from 26 to 30C. A tiny island only 9km long and 2 km wide, English speaking population of around 5,000 with one town, Port Elizabeth and a few charming villages. Lying just north of the better-known island of Mustique famed for it’s royal & celebrity connections. Bequia in comparison was sleepy and off the beaten track, a sailor’s secret, but without a decent hotel / resort. I saw an opportunity to fulfil this with my new project and at the same time have the perfect excuse to build, creating a home in paradise for myself, my family and many friends. There is a book written in 1965 called "Don't stop the Carnival", by Herman Wouk. It is about a New Yorker that escapes the rat race to a small Caribbean paradise to reinvent himself building and managing a hotel! I have read it several times and have come to realise now I have been through virtually every page in the story and could add a few chapters myself! Bengt explaining his plans by drawing in the sand trying to persuade his slightly sceptical late wife Karin. Looking back, I hadn't a clue what I was getting myself into when aged 56, a lawyer in a previous life and property investor taking on a retirement project of this scale building a resort on a small isolated Caribbean Island. 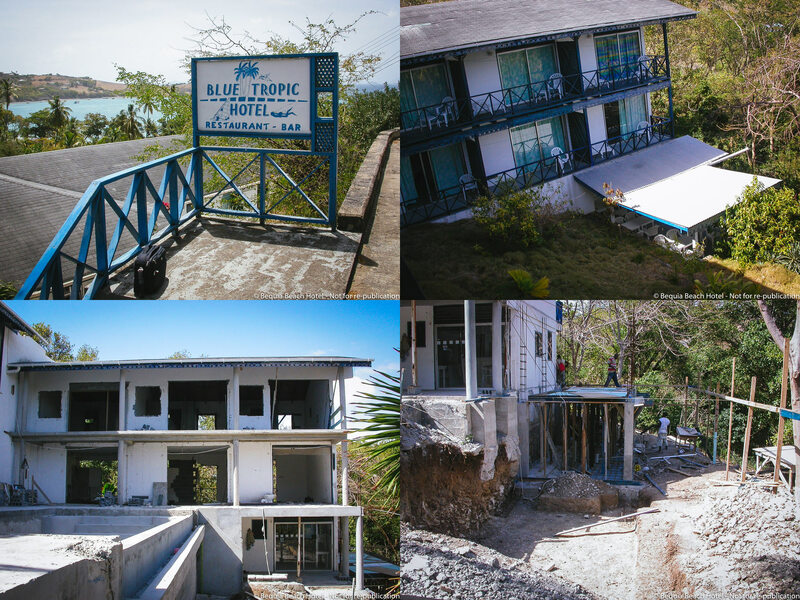 After purchasing the original derelict beachfront B&B in Friendship Bay the day after I returned to London hurricane Ivan was heading towards the Caribbean, hardest hit was Grenada. Shortly after Ivan passed by Bequia I received photos of my newly purchased prime ‘beach’ front property now without a beach! The hurricane and storm surge removing all of the sand offshore, locals would reassure me that the sand would return to Friendship Bay, they were right, although it took a couple of years. As a Swede and very hands on I wanted European quality on everything in this once in a lifetime project. To attain that I decided to start my own construction company after a few early missteps, employing only local workers, with the exception of two Polish workmen to expertly tile my new bathrooms and share their knowledge. I bought my own heavy equipment instead of, waiting for an excavator to become available a week later to dig a foundation. Bequians are music lovers. When my expensive JCB backhoe finally arrived on a banana boat from the UK the operator first put on the music loud in the cabin and somehow managed to dance with it with the help of its support legs at the back and bucket at the front! I rushed to stop him! I recall every morning chasing away the local's goats from the future resort that fancied my newly planted flowers as well as iguanas and stray dogs and cats that every morning drank water from my newly constructed swimming pool. Bequia has no piped water supply so I decided to build my hotel the old fashion way with water-tanks located below every building and use the roofs as catchment. It has been working well. The project has kept me reasonably physically fit by constantly walking the construction site and clear in my head dealing with the logistics in bringing all material here. Virtually everything has to be imported, if not from Europe, from US, South America or from nearby islands. But after each busy day in the evening I could swim from one of the most beautiful unspoiled & empty beaches in the Caribbean staring at the cloud formations or sunset skies. I could tell many stories from the construction times but they are better-suited for the bar! The climate in Bequia is perfect for human beings. The locals are all very friendly and supportive, having contributed to much needed job opportunities. They are also very loyal and our many repeat guests love seeing the same faces on their return. I believe Bequia’s seafaring heritage plays it’s part here, the locals are very friendly making anyone feel at home. My reward is when I see hard work paying off, it works. Highlights are chatting to the guests in the Beach Bar over a rum punch or glass of wine and mingle with them at the weekly Owners Cocktail. I’ve found there are so many interesting life stories to listen to, many appear fascinated what I have done and being introduced to the laid-back atmosphere of Bequia and the high standard of the hotel and are now keep returning year after year to relax and have fun. Bequia is one of the few true "old style" Caribbean islands left, not commercialised and sparsely developed. It's still a good place to relax and "get away from it all...". Despite its "off the beaten track" location more and more tourists are discovering Bequia and its natural beauty. Bequia has a strong seafaring history over three hundred years with one of the finest natural harbours in the Caribbean at Admiralty Bay. Since the mid-1800s whaling and boatbuilding became the island’s twin mainstays – in the 1970s ‘Water Pearl’ was built for legendary singer Bob Dylan. Celebrities seeking an exclusive hideaway in the true Caribbean still retreat to the island of Bequia for a relaxed island vibe and where anyone can slip under the radar! Have the island changed since I started my project? Not very much, maybe there are fewer old sailors around in the bars. During the last years many more luxury villas have been built, construction now being the island's largest source of employment after tourism. There are fewer power cuts and we have fast internet, your mobile is working everywhere and the infrastructure has improved but the people have remained as welcoming as ever. Whilst the hotel is complete, welcoming new and returning guests, the experience and extreme challenges faced by construction on a small Caribbean island continue to keep me busy. A few years ago, acquiring the land of the former Friendship Bay hotel – where I first set foot on New Years day 1993 with my brother, thinking to myself what a beautiful spot. We are developing ‘Friendship Bay Estate’, a number of high end luxury villas linked to the hotel that will be for sale in the near future.